IVANA CHUBBUCK, world class acting coach who gave Halle Berry her Oscar best actress award, is back in town to give a two day master class in acting for ABS-CBN’s STAR MAGIC. At the solo presscon hosted for her by Star Magic’s Thess Gubi, a video was shown interviewing stars who attended her first workshop two years ago: Piolo Pascual, Jake Cuenca, Dimples Romana, Arjo Atayde, among others. All of them spoke highly of Ivana’s acting technique which is described in her best-selling book, “The Power of the Actor”, that has been translated into 18 languages. Ivana will be holding her two­-day workshop on September 3 and 4 at the Dolphy Theater. The master class would have participating actors re-create scenes from Hollywood films, which will be critiqued in the same manner that Ivana does with Hollywood stars. Similar to the master class two years ago, observers are open to witness the two ­day event in order to cull tips from the respected Hollywood acting coach who looks like our very own Pilar Pilapil in person. 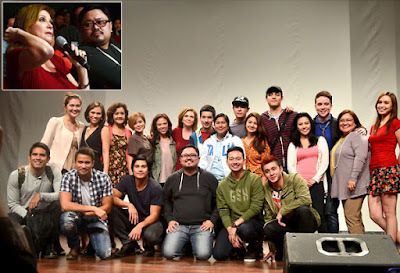 Star Magic Artist Training Head Rahyan Carlos underwent an intensive teacher’s training program under Ivanna, which allowed him to become proficient in the different levels of acting classes, from Introductory to Master Class. Direk Rahyan earned the title of being the only Filipino authorized to teach the ‘Chubbuck Technique’ in the Philippines. For inquiries call ABS­CBN Star Magic Workshops at 415­2272 local 5142 or 5243 or email us at starmagicworkshops@abs- cbn.com. Or www.facebook.com/starmagicworkshops.